These are the suggested reimbursement rates for employees' private mileage using their company car from 1 March 2018. 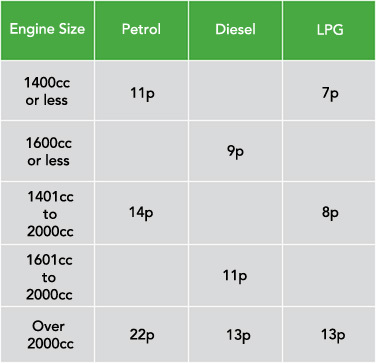 For Hybrid cars you must use the petrol or diesel rates. These rates exist for employers to reimburse employees for the fuel used on business mileage in a company car where the employee is paying for all fuel at the pump, or altnernatively can be used to eliminate fuel benenfits in kind if used to calculate the cost of private miles driven by the employee which he or she then fully reimburses the company.